Which Post Production Software do you use? One of the enlightening discussions going on over at our forums has been one where Nieton21 asked what post production software that readers use? I enjoyed the responses so much that I thought it was a worthwhile question to open up to readers here on the blog for another of our famous reader discussions. So – what post production software do you use? Is it Photoshop (if so which one – CS2, CS3, Elements, Lightroom), Apple Aperture, iPhoto… or something else (or nothing at all)? It might also be useful to tell us whether you’re on a PC or Mac. In addition to telling us which one you use (or don’t use) I’d love to hear your reasons why. What do you like about the software that you use? What do you wish they’d improve? Looking forward to hearing your answers – hopefully somewhere in the discussion those looking for advice on this topic might learn a thing or two! I've used Lightroom since the first version. I've tried Bible and DxO and decided to stay with LR3. DxO has its advantage if you use the camera and lens combination they supported. Overall, LR3 wins. It's a complete package for my use and there's a lot of nice plugins for it. ACDSee Pro 5, really like it, has a great and easy to use Organizer and very accurate image editing. Professional quality, none of that "scrap-booker" junk or goofy tricks. If you are a good photographer this one really helps. I got out of photography for a while and got involved in building and servicing PCs, and still do some but have been reinfected with the love of photography. I have used Windoz, but always resented the unreliable behavior of of the system, I often thought well maybe Mac. But then discovered Linux, I have bounced back and forth between SUSe and Ubuntu, tried Mepis, but recently fell in love with LinuxMint. But after some research I realized I was missing too much by not shooting raw. I did not want to spend the money for LightRoom, so went back to searching the magic words for Linux users, Open Source Software and found "Dark Table" a compatable to the Light Room software. I have not seen it mentioned here, but I would recommend you and the Readers go and check it out. Linux has some nice Raw programs but I would Classify DarkTable the the Super users software. I have a MacBook and I use Aperture for most everything. Gimp if necessary. I have a PC with CS3 and lightroom installed. In my opinion these are great programs for edditing and organizing your photos. I started with Elements and then moved on to Photoshop and Bridge. I am satisfied with these products and recommend them to others. I don't have experience with non-Adobe to not say how these compare to other products. i use photoshop cs4 64 bit, and lightroom. Struggling some with moving pix into website using Photoshop CS4 and Dreamweaver but I'll get it one day. Just upgraded to Photoshop CS4 Extended. LOVE IT! I'm very happy using Photoshop CS2, Silver Efex Pro and Sharpener Pro 3.0 on my PC with Windows XP. I have an HP Compaq with plenty of RAM and a 500GB stand-alone Seagate hard drive for picture files. My monitor is a Samsung, 19" Syncmaster 920N (way too small for good postprocessing editing). My printers are an HP 8250 for text and low-key photo printing and an Epson R1900, 13"x19" for doing the best larger printing, panoramas and CD printing. I use Nikon Capture NX 2 and am very surprised you did not list it as a choice in your poll. A commercial bias perhaps? Photoshop CS3 & Neat Image on Windows. Count me in, I use GIMP. Lightzone & Photoshop 7 on a Windows PC. Uploaded to Lightroom and adjusted in Nikon Capture and final processing at CS2. Otherwise photomatix for HDR then CS2. I use Elements 5, and Windows Visa on a lap top with 2 gig of Ram to make elements run smooth. I'm not very good at it yet, but I'm working on it. I process my RAW photos in CS2 on a Mac. I create photo books using iPhoto. It's a great program. I use a PC and always the current Corel program, Pro Photo X2 at this point. Why? I've used Corel for many years....just stuck with it. Lightroom fan since it available on beta. Bought $200 online was a better deal that Aperture. CS2 mainly for more sophisticated editing. CS2 and Lightroom works nicely together. I use Capture NX, and PS for the "extras" (borders etc). You can't beat NX for a Nikon shooter. Cumbersome, slow but worth it. I've glanced over all the posts and it still surprises me why Capture NX isn't used more. Are there any Nikon shooters out there on a forum hosted by DPS??? See my May 25 reply. What about it Nikon shooters? For organization, I use Windows Explorer and Microsoft Photo Info. For simple fixes, I use the Windows Photo and Fax viewer. Otherwise, I use Paint .NET. I'm a Mac person and have been using iPhoto (primarily for basic edits and organizing) for the past several years and using Photoshop CS for more extensive edits That said, I'm ready for a more robust application-especially since I've finally started shooting in RAW with my Canon 30D. Just for the record, I have a 15" MacBook Pro 2.16 Intel Core 2 Duo and just recently upgraded from 2 GB RAM to 3 GB. I've been trying out both Aperture and Lightroom for the last three weeks and it's been really tough trying to decide. I felt more "at home" with Aperture in the beginning, but Lightroom has been growing on me the more I use it. It's a mixed bag: I much prefer the non-linear way of working in Aperture over the module method of Lightroom-Aperture just gets out of your way and lets you work. I also overall prefer Aperture's organizational features; however, Lightroom's Develop module is exceptional and has many features that Aperture lacks...I love the highlight recover, fill light, and vibrance tools to name just a few. Oh, and the selection tool in the curve adjustment is brilliant. The other big thing working against Aperture is that it tends to lag in speed, albeit the upgrade in RAM has helped. Lightroom still beats it hands down in this area. So far, it looks like Lightroom will eek out to be the winner in the great debate but I am a major Apple supporter (not to mention shareholder). That said, I anxiously await Aperture 2.0. I have a feeling it may be just the ticket. I use the Gimp for windows cause it's free! I'm using Lightroom and CS2. But most of the normal postproduction process can be done in Lightroom. I use Bibble Lab pro with RAW adjust and convert TIF and JPG format. I use Photoshop Lite 5.0 to convert WEB size. PTGui I use to panorama photos. I use PaintShop Pro IX for about 90% of my post-production. I routinely use a few favorite "photoshop" plugin filters from Flaming Pear and Xero which integrate just fine with PaintShop Pro. I do have CS2 but my current computer barely copes with it, so I only use it for the few things that PSP lacks. PS has a better channel mixer, for instance, and the Nik plugins don't work for me in PSP. I'm not jumping to CS3 until I can afford to upgrade the PC as well. Which will be a while and by then CS4 will probably be out! I use Canon's Digital Photo Professional for the occasional times I shoot in RAW. I mostly shoot in the highest-quality jpg mode but occasionally if I'm in an unusual lighting situation I'll do RAW. I've had much better luck with my RAW pictures in DPP vs Adobe Camera Raw. I use Adobe Elements 4.0 (just upgrading to 5.0). Easy to use, has most of the functionality of CS2. I am working with a Mac Computer and decided for Aperture. Lightroom wasn't around when I made my decision. Overall, I am happy with the software, though sometimes I miss Photoshop's sophisticated editing tools. For those instances I use Photoshop Elements. I am just a hobbyist and no professional, so I mainly use Picasa mostly for resizing and cropping. I have tried Lightroom, and while I like it and its features, it is quite slow on my old PC. With my EOS 300D I used Capture One Pro, after that (if needed) I used Ulead Photo Impact with 2 plugins (mostly) Focal Blade (sharpening) and Noiseware Professional. I use PS CS3 for everything, although I just got Lightroom and am enjoying learning how they work together. I use LightZone, Gimp and GThumb on Linux and Gnome Desktop. I use a combination of ACDSee Pro (I like the way it processes RAW), and re-touch in photoshop CS3 if required. I hate spending time at the pc doing things to my image. I like to think I am more a photographer than a computer geek so i try to get as close as I can to what I want with my camera than with the pc. I thought thats what photogra[hy was about, the challenge of capturing something thru the lense. I'm also very aware you can't make a silk purse from a sows ear and chances are if your original image is crap, then the manipulated image will be too. I do use Picasa to send images as they are automatically reduced in size and my friends don't get up my nose about having to recieve huge files. Should I want to "crop" or ad "text" or a "frame" I use "Photofiltre" or "Photocleaner". I use Paint Shop Pro and have just upgrade to Paint Shop Pro Photo XI and find it does all that I want. And it pays to download the upgrade that Corel send online. I simply cannot afford Photoshop so I leave Elements alone as well. I use Paint Shop Pro and have just upgrade to Paint Shop Pror Photo XI and find it does all that I want. I simply cannot afford Photoshop so I leave Elements alone as well. I have a Nikon and therefore am stuck in the middle of the Adobe/Nikon battle. I process RAW in Nikon's Capture NX and then usually finish up in Photoshop. Each program does stuff the other doesn't. Capture NX has some intriguing features that are really powerful. Take a look at their website and look at the tutorials! I am a scrapbooker and since I can't afford Photoshop, I used Paintshop Pro versions 5-10. I purchased Photoshop Elements 3 and simply wasted my money on that. Paintshop Pro is so much more advanced than Elements 3. I use Paintshop Pro for scanning as well as working with digital pictures. Now, Paintshop Pro 10 just didn't show me much so I did purchase Photoshop Elements 5 a couple of weeks ago and it is fast catching up with Paintshop Pro. Still learning the new program. I don't do tags because in the 3 programs I have for sorting my pictures I save them by date. As a Linux user my software options are more limited but still functional. I use gThumb to retrieve, view and organize my photos. It will also perform basic editing. F-Spot is my choice for the easy creation of galleries on Picassa or my personal web site. The real work horse of photograph editing is Gimp. The number of editing options in Gimp are extensive but the learning curve is very steep. I'm using a 20" iMac with iPhoto6 and Photoshop CS2. I used the Aperture demo and I KNOW it's the one for me. I don't have the cash for it right now, but I will get it. When I do I think I'll still use CS2 for the major phot editing work, which won't be much. I shoot RAW for [pro] work and JPG for casual stuff. My backup strategy is manual: dupe the library, burn to DVD, and backup on iPod video. Crude, but it works. I use the gimp on a unix-based machine (either linux or freebsd). free software rocks! iPhoto to organize and store, Photoshop CS3 to edit. Genuine Fractals, and Nik Sharpener Pro. I have tried Aperture and have not gotten into it, although I would like to use it instead of iPhoto sometime. Moving 6,700 photos could be harder if it was other software, I'm just too busy to change my process. PC...PAINT SHOP PROPHOTO XI, CANVAS X, ACDseePro, VIRTUAL PAINTER 5, PORTRAIT PROFESSIONAL, PRO SHOW PRODUCER, SURETHING CD LABELER DE LUXE 5, INTER VIDEO MEDIA ONE. I use ACDsee for quick deletions, renaming and re-sizing. I have seen that ACDsee will have some problems if windows Explorer is open. For quick easy photo edits I use Elements 5.0. For the critical stuff CS2 get the nod. I'm still looking around. Have been using ACDSEE, but it doesn't like PEF files. I have been with Corel since the dawn of time and find it much friendlier than most and some of it's tools esp. masking ones are better than most. I do have the adobe suite, but just can't get into it. I use CS2 and Bridge. I'll be updating to CS3 in the near future. Since I am using a laptop as my primary computer, my internal harddrive is very limited. I build up my Aperture Library in my external harddrive which stores all versions of my RAWs. After further editting I would export the really good ones to JPEG and import to iPhoto on my internal harddrive. So basically my iPhoto stores my best photo and is used for showing off my photos to others. I shoot in raw whenever I can and find Rawshooter Premium 2006 saves me tons of time. I also have PS Elements for the more tricky shots (what I really mean is badly exposed or something). RSE allows me to browse/manage my photos, crop and make basic white balance and colour adjustments without using PSE which speeds up my workflow a lot. I own Photoshop elements 5.0; Corel Paint Shop Pro XI: and Microsoft Digital Image Pro 10. Each have their strengths and some weakneses. The program I use the most is Corel Paint Shop Pro 10. It's about as powerful as Photoshop Elements but much more user friendly. I use Lightroom + CS2 on a PC. Never tried Aperture, but it looks like a nice piece of software, although more expensive than LR. I also use XnView when I just want to navigate through the images, and also do some batch operations, like conversion or resize. Also have iView MediaPro 3, which is a powerfull tool for cataloging (almost) all kinds of file types, also allowing to see all content offline. And I use RoboGEO to georeference my photos. I use Paint Shop Pro 10. I've been using Paint Shop Pro since version 3; it does a good job and the price is right. I use the free-software Porta for web publishing. Picasa for organizing between folders. And I just got Lightroom and it needs to grow on me, Picasa is just too fast and easy to use. I don't tend to do much manipulation but use Photoshop Elements 3 on the PC (I like the tagging/organising and also the fact that it supports RAW images). Fspot to organize-- The Gimp to work on. Curious to know the results of the survey as I am considering other Post Production s/w!! The basic : Lightroom to manage and fine-tune and Elements to fix and edit. I like Picasa's interface and quick fixes to photos, but it doesn't offer enough options for viewing and organizing. I don't like ACDSee's interface as much. Especially because it opens up an entirely new window every time I want to do editing on a photo. What I do like about ACDSee is that it lets you tag photos and interface with the database very easily. I suspect I will end up using them both since they both have their advantages. 2) When I imported all my photos, it gave me a huge list of ones it didn't import. I don't want to take the time to find these photos and force it to import. I use Lightroom for most of my photo basics and deal with the real difficult edits in Photoshop CS3 - I use a PC, I used to use Picasa but found that lightroom manages the files quicker and with a more robust post processing palette. Mac - Lightroom primarily, but also have access to PS3. As a faithful Apple user, I first started off with Aperture but after much coaxing from co-workers, I decided to give Lightroom a chance and I haven't turned back since then. Lightroom by far is much more efficient to use. I use Microsoft Digital Imaging. The program came loaded on my computer and I used it, got used to it, and bought it after the 90 day free trial. It suits me fine because I don't do a lot of altering or "photo art." Picasa for organizing and light post processing (new versions have support for RAW images). Gimp for serious post processing work (using RawShooter Essentials for RAW support). Irfanview for batch resizing. I use Paint Shop Pro XI...AND love it. Will venture to Photoshop eventually when I can afford it since I don't feel elements has all that I want at this time... PSP has been very user friendly and so far I can do ALOT with it. Photoshop Elements 5.0 and soon to get lightroom. RawShooter Essential for RAW conversion; PSE 4 for JPG touch-ups and photo management. When I need to fix a batch of photos, DC AutoEnhance is unparalleled. I tried Noise Ninja, and while it was good, its results weren't any better than RawShooter's noise reduction. Aperture for organizing and cataloguing, then CS3 for editing. I'm not entirely satisfied with the solution I have now, primarily because Aperture doesn't run well on my MacBook, but I'm forcing myself to use it because it's a better archiving system then what I had before. Im using arcsoft photo editing for my digital shots. and Photoshop 7. you can visit my multiply site http://alexskywalker.multiply.com to have a look at my pictures and other stuff. I use software only for cropping and brightness adjustments. I use Canon's Zoom Browser. I have Adobe Photo Deluxe 3.x, Photostudio 5.5, and Microsoft's Picture it Premium 10. I really am not into photo editing, I like the rreal deal. software cost = 0 i am still missing the color space stuff in the gimp but it is scheduled in the next version. I use Apple Aperture to manage my photos and do some retouch. Sometimes, I use Photoshop CS2 to do advance adjustment. Lightroom, CS2, and for extremelly quick turn around and emails when pictures require no post-processing ( I hate to admit this...) I use Canon's Zoombrowser. One thing Zoombrowser does very quickly and efficiently, is reducing the picture size and resolution for emailing and stuff like that. I did try to use DPP, but found Lightroom much more useful and would like to attempt to reduce the number of photo software I have on my system (PC). Keep up the great work Darren, and everybody else who is helping you produce such an awesome site. I've mainly used Capture One Pro for the past year or so, but have found I'm using Lightroom along with Photoshop CS2 more often now. For batch images i use Picasa2, its so easy. I use Photoshop CS2 windows at home and mac at work. I only use this because it's what I was trained on, am familiar with and use daily. Most of my post-processing is done in Lightrooom (for PC) and any detail work or corrections done in Photoshop CS2. I've switched away from PaintShopPro X to Photoshop Elements 5 w/NoiseNinja3. I've also got Capture One LE which I use occasionally. I have just started using Lightroom, mainly to import and rename photos. I then use CS3 with its camera raw processing to make initial crops and adjustments. CS3 itself is then used to finalise any further adjustments, and save the final image in jpg format (normally for the web). The main issue I have is that my PC is getting old and is very slow. Lightroom slows to a crawl if I try and process more than a dozen photos at once. I'd love to get a new PC and then probably switch to using lightrom for more than just organising my photos. I'm also quite organised, and keep photos in a well maintained directory structure that allows me to locate an image quite quickly outside of any software database. While I don't mind post-production work (although I wish I could take a photo without the need to), I sometimes get overwhelemed by the sheer volume of photos to sort and pp - a day at the race circuit seems to result in 400 or so photos to sort through. I personally use Adobe Lightroom, mainly as a library and also some things like curves, color corrections, contrast etc. Next to that I use Adobe Photoshop CS3 extensively for retouching and the more heavy duty post processing. I use Picasa and PhotoShop (though i'm not very addicted to post production actions). Picasa2 for quick changes and Gimp for when I really care. Bibble Lite 4.9.5 on Kubuntu 7.04 Linux for raw processing and non-destructive editing and enhancement. It has some of the best photo enhancement features I've come across, and has rescued a number of images I had initially thought useless. I also use Gimp occasionally for editing and special effects, and Digikam for managing my photo collection. I've also started to experiment with Photomatix (using Wine) and Qtpsfgui for HDR imaging, though I've only just begun exploring this technique. I start with Breezebrowser, which I use to relabel all my images and videos to a common format. Some of the images get label sequentially and separated into another folder, which is very easily done by Breezebrowser. Then I select my favourite photos by giving them star ratings using Adobe bridge. I currently use Adobe Photoshop CS2 and ACR to process the raw images, though I will probably upgrade to CS3 sometime soon. Within CS2, I reduce noise with NoiseNinja and correct for lens/vertical distortion using PTLens. There are then minor adjustments to curves and any touching-up or removal of blemishes. I also have Lightbox, but haven't used it much. It might be more useful when I upgrade to CS3. I would like to use it for adding IPTC info to photos in batches. I may move to using Bibble Pro for raw conversions, as it builds in the NoiseNinja. Though I have RoboGeo and always use a GPS to take tracks of my locations, I don't use RoboGeo to add location info to my photos. I would ideally use a program (not yet written, to my knowledge) that automatically suggested IPTC and description info based on an Internet database of well-labelled photos in the vicinity. Maybe Google could be persuaded to take on such a project. photoshop CS3 w\ bridge for organizing (on PC).mostly because it's powerful and I know how to use it good and fast. CS2 and a Mac. CS2 already does everything I need it to, so I saw no point in upgrading. I use Macs because PCs make me want to punch holes in the wall. I have been using iPhoto for a while and have now upgraded to Aperture for better RAW support. Sometimes I use other tools like Photoshop CS3, PhotoMatix or the GIMP. Gimp, UFRaw and a little bit of F-Spot, all in Ubuntu. I got hooked on the Lightroom beta, but don't really use Windows enough to justify the outlay. LightZone is similar in some ways, but I haven't got on well with it in Linux yet. Hi all, I have updated to CS3 web premium (i'm a web designer) and a enthusiast photographer. I have to say that the fudion betwen Adobe products and ex Macromedia with the release of CS3 is pretty good but still needs a lot of work, I LOVE the new Bridge along with Photoshop. Most of the work I do with photography I do it with the pretty good and stable and with new options RAW setup and then finish it with Photoshop. Differences between CS2 and CS3 nothing that would make me run to the store to upgrade. I use Picasa/Picasa for Linux and The GIMP on both Windows and Linux. Lately I kind of moved from Picasa to the GIMP more and more. Right now, I'm stuck with Paint Shop Pro 7 at home and CS2 at school, but I hope to pick up Lightroom and CS2 or CS3 for college next year. I use Photoshop CS2 and hopefully within a few days CS3, I use Bridge and Lightroom. I especially am very happy with Lightroom! I use DxO optics Pro 4 for starters and fine tune the RAW as well as correct any lens issue and colour. 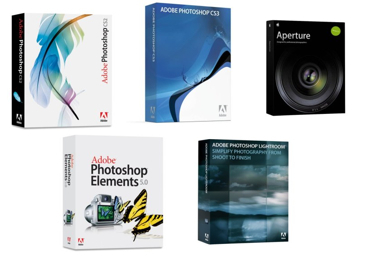 Photoshop CS2 as of now, still have to get CS3. I am a novice to intermediate guy and I am happy with Picasa and some time use photoshop for framing etc. Photoshop CS2 for RAW conversion and processing, ACDSee for browing and catalogue, Neat Image for noise and Photomatix Pro for HDR. My 2 primary tools for post production are Lightroom and Photoshop Elements 5. I really like Lightroom the more and more I use it, but use Elements when I want to do additional work. I use Adobe Photoshop CS3 and Adobe Lightroom. I absolutley love Lightroom as I shoot mostly in Raw. I have used Aperture in the past but prefer Lightroom. Aperture and PS CS3 on a Mac. Graeme is right, though: Aperture is a bit sluggish even on my MacPro with dual 2.16 Ghz and 5GB RAM. I suspect that the bottleneck may be that I got the machine with the low-end graphics card, though. Photoshop CS on a Mac. I only use my work computer, and have the Adobe CS Suite. We're planning on upgrading to CS3 this summer. iPhoto mainly. Occasionally I'll drop a photo into Photoshop Elements for more advanced retouching. Picnik or Preloadr for editing in browser when i travel. I use Digital Photo Professional in combination with Photoshop 7. I'm working on Mac OS X.
I use a Mac and a PC. Lightroom is used for most post-production work, with Photoshop CS used for detailed retouching. Some DAM is done in Lightroom, while some is still using iView Media Pro. I'm in the midst of migrating my archives over to Lightroom. It's all CS3 and Lightroom for me, is there really anything better? The Power Retouche add-on is fabulous. I am also looking more into Bridge CS3 and see what it can do for organising the 1000s of photos i have on my HD. I used to use Picasa and my girlfriend still uses it to browse our photos. I now use Lightroom and CS2. I love lightroom's functionlity but it's performance on a PC is TERRIBLE. I'm considering moving to bridge and CS2, which would be very dissapointing. Photoshop CS3 on Mac (1st Gen MBP). Used GIMP before a couple of years back but they only support RGB (I think). PS CS3 is my main workhorse mainly because I've used Photoshop since its early version of 4 (if I recall correctly). So, I've gotten very comfortable with its layout, its tools, shortcut keys and its result. I'm pretty fast with it. Plus, I also do graphic design which also depends largely on Photoshop and Illustrator. Other software that I've tried include Adobe Lightroom and Apple's Aperture. I used GIMP for a while, but in reality The GIMP is terrible for photo post-production. Don't get me wrong, I like The GIMP and use it for everything besides photography. The gimp only supports 8 bits per channel so doing any kind of RAW conversion in the GIMP is complete waste of time. The GIMP still finds its way into my work flow after I've done everything else I need to do between shooting a RAW and saving a PNG or JPEG. All you Linux guys that are shooting in RAW should seriously check out Bibble (even you Windows and Mac users should check it out, it wont kill your system like Lightroom). I use Elements 5.0 for some very basic resizing, contrast, and color correction. I am currently looking at Lightroom to process and organize the raw images that I have started shooting. I am on a PC. ...forgot to say, have used gimp too - used to be a linux person... :) good app! Sven Blom...try picasa2... works a treat! It's a free and powerful image editor. I've been using Bibble. It's affordable, it has a few nice extras, and it's reasonably fast. I tried Aperture but it literally reduced my DP 1.8ghz iMac to a crawl. I can't afford photoshop. The pentax stuff that comes from Silkypix is crud, and the actual Silkypix thing was really bizzare on my mac. Glad to see so many people using GIMP! I'm another GIMP user and all the photos on my photoblog linked above are produced using that fine bit of software. Why? I couldn't afford to shell out for the full version of Photoshop when I first started out many years ago and I didn't use Windows or a Mac. The GIMP has served me very well all these years. Tried Ligthroom first but couldn't get used to some of the way it does things. Aperture just felt like home faster. I tried Lightroom, it ate too much RAM and processing power for my PC. PS is just the best. Photoshop CS2 (@Matt - legal copy, nanner nanner!). Tinkered with Lightroom and CS3 when the betas were out. But am happier spending my cash on photography equipment right now than upgrading. I currently use Adobe LightRoom for RAW processing on my PC. I export to tiffs to do any masks, extra edits, cleanup and sharpening in Photoshop. I also use the Noise Ninja plugin w/ Photoshop. I'm thinking of switching from LightRoom to Capture One Pro though. We shall see. I use digiKam and Gimp on Ubuntu. I am on a Mac and am using mostly aperture (education discount)for the organizational aspects with CS3 if needed. I am not really into a lot of post production manipulation. I am surprised my the large amount of mac users not using aperture. ACDSee 8 on Windows XP for post-production clean-up. Flickr for my online photo album. Bibble, I LOVE BibblePRO. Its an easy to use, powerful, and reasonably priced photo post-production application. I originally bought it because I was running Ubuntu and wanted to be able to process my RAWs. I now use it in Windows and wouldn't switch from Bibble for the world. If you don't use it, you should at least give it a try. Btw... how many of y'all actually *paid* for Photoshop? I use Adobe Photoshop Lightroom on my G4 Powerbook. I tried Aperture but hated it. It was sooo cluttered and confusing. Lightroom is very neat and extremely straightforward. It just works so much better for me. Lightroom mainly and sometimes a little Photoshop Elements. PaintShop Photo Pro XI for post processing. Canon DPP for Raw processing when needed. GIMP or Photoshop for photo retouching and levels / curves. @ Sven Blom: There are a lot of online photo editing sites, just google for them. There have even been comparisons on which ones are the best. I use Adobe Photoshop Lightroom and Photoshop CS3. They're a great combo. But then I sometimes use Capture One Pro when shooting tethered with my 5D. Photoshop all the way. I've tried other programs, but I spend so much time inside Photoshop at my job that it's pointless for me to try and learn another application at this point. After my photos are polished in Photoshop, I'll import them into iPhoto and publish them to a picture page. I'm not partial to iPhoto, I just like the ability to quickly add the photos to a page and then drag-and-drop them in order if I need to. If anyone has a suggestion for an easier/better way to do this, I'd love to hear them. I also have PS Elements, and Noise Ninja, and use both occasionally. But there is little Aperture cannot do, and it does it with grace. I use Photoshop CS3 on a PC. Tried Lightroom, but there is nothing in it that is important to me that Photoshop and Bridge cannot do. Using Photoshop 7.0 on a PC (Windows XP Pro). I use Lightroom as the $200 price tag is just in my range for purchase. CS3 is too far out for me at $600. I'm learning Lightroom and won't need photoshop until I hit lightroom's limits. Photoshop ps3 I use (though less and less recently) for some tasks and such.. but mostly lightroom. Sven Blom- I would suggest using picnik @ picknik.com while on the road. They are a bit more robust, and offer some really great functionality. Best of all it's free. I am on a dual G5 with 2.5GB of ram and a macbook pro. I Currently use Aperture but I am leaning towards Lightroom when they update it to 1.1. 2 things missing for me in lightroom include an easy way to move projects from laptop to desktop computer and the ability to easily upload photos to flickr retaining all the tags. Aperture does both of these very easily. My main complaint with Aperture is speed or lack there of. Photoshop CS3 on a PC -- I've just always been a Photoshop user since version 5 or 6 -- no point in changing now. Digikam for organizing and viewing/browsing, The Gimp for editing, etc. PC (Windows XP) user and I use Paint.Net (free) for light stuff but otherwise mostly Gimp. Using Macs. Recently moved to Lightroom + Photoshop CS3. Occasionally employ Photomatix etc. I use Picasa for viewing, organizing, and basic adjustment. I also use Jasc Paint Shop Pro 7 on occasion. I use aperture for photo organization and modification. BUT you can't beat photo-editing with photoshop. Aperture is AMAZING, i wouldn't use anything else - all i could use now is a faster machine! (1.83 Core Duo Macbook 2gig ram) and a larger hard drive for all those RAW files aperture works live with. I have Mac, Windows, and Linux boxes at home. My post processing tool of choice is Bibble Pro. It's a niche app that doesn't get a lot of attention, but should. It's not a nice workflow. They have work queues where you add photos. This narrows down the photos you need to pay attention to when editing. It supports copying of settings between photos like most apps. They also recognize lenses and automatically compensate for lens distortion, etc. based on built in presets. This is a nice touch. Don't forget Noise Ninja integration. Good tech support and community. But don't forget that it runs on Mac, Windows, and Linux. It feels like a Windows app, but I'm willing to deal with that. Try it out. Linux, F-Spot and Gimp! Yay! Plus the various command-line utilities, like identify, convert, etc. which make working with images so easy. GIMP + UFRaw on a PC powered by Linux OS. That gives me all the features I need for free. Gimp right now, running on various machines with various operating systems installed. Xubuntu, Ubuntu, XP. I also have Jasc Paint Shop Pro which rarely gets used, Picassa to organize, and some other free apps that I find excel in various areas. Although this'll mostly be blown to bits this summer after I get a Mac with CS3. Still waiting for Apple to update their lineup..
Aperture for almost everything - importing, managing, most adjustments, exporting (nice Flickr uploading plugin) . . . Still learning Photoshop, but expect to use that increasingly for more extensive changes. Aperture plus Photoshop Elements 3/CS and Noise Ninja running on my 24" iMac. Great machine, but Aperture is a bit sluggish even with 2GB of ram. I use a PC and I use Photoshop Elements 4...sometimes...I get really frustrated because sometimes it can be just SO SLOW. I think that is partly my computer (need an upgrade), but I've heard many complain that the program can be slow, so I think it is also partially the software. Does anyone know if PE5 is any better? So, when I do get too frustrated with PE4 and don't need to do anything too fancy, I will often actually use Picasa. It can actually do a lot of the basic things I like, has some great one-click filter effects and best of all, it's FREE! I use Paintshop Pro X. Would love Photoshop, but just can't afford those prices and Elements doesn't do all that I want to do :( Am amazed so many people use the full Photoshop, actually, given the cost. I use Photoshop 7 because I can't afford to upgrade, and my copy was "given" to me by a friend. DxO Optics Pro on Windows. Photoshop CS2 only if anything needs further work after DxO (red eye, for instance). Canon DPP, Jasc (Corel) Paint Shop Pro XI Photo. Noise Ninja. Photomatix. For viewing and organizing I use FastStone. Nice feature set even though it grabs lots of system resources. For processing, its PhotoImpact, a program I've used through many versions and found fits my needs. Mac - DxO Optics Pro is pretty much all I need on most shots. On rare occasions I break out Gimp Shop or Photomatix. Once I went digital, I used (and loved) Google's Picasa and quite a bit of PS7, both on my PC. Once I went Pro, I switched to Adobe Lightroom, and very rarely need to use CS2 (mostly for major removals, compositing, or skewing), still on a PC. I use IPhoto for quick and lightweight stuff. Lightroom for most of my work. Mac addict. Right-Brained. Love to mess with the presets. Primarily Photoshop and Lightroom. PhotoMechanic for browsing and tagging. I use Linux only. I manage pics with dirs and gqview. it's much like acdsee classic. I'm thinking moving my pics into digikam or kphotoalbum. For raw-processing I use ufraw and with batch runs dcraw. I'm amazed with the speed of ufraw development. It has (0.12cvs) about the same features than Raw plugin of Photoshop CS2. For image manipulation I've been using Gimp (better gui) and Cinepaint (support for 16-bit manipulation). I hope gimp will get the 16-32 bit support working some day! I'm a PC user, and I usually will start out with Paint.Net if it's something simple like cropping or rotation, otherwise I'll go into Gimp. I use photoshop CS2, but might be switching to CS3 soon. I tried using Lightroom, but I feel it's really oversimplified and not well organized for my work flow. Also lately I've only been unsing Photoshop CameraRaw 3.3 it saves me a lot of time and with most photos I don't even have to open up photoshop. I use a Mac; I import with Canon's EOS utility, sort everything out with Adobe Bridge, and take care of business in Photoshop. I'd already purchased Photoshop for doing web design work, and it only made sense to use it for my photos as well, since it's such a great application. Another linux fan. I organize and do some simple edits with F-Spot and use the Gimp or more complex processing. I have used all of the ones mentioned above (not the Linux ones ;-) due to nature of my work, but stick with Capture One from Phase One for my personal shots. i use Digital Photo Professional which came with my canon camera for simple RAW converting and adjusting. one of these days i'll get photoshop, but i like actually seeing my picture and not completely distorting it in photoshop like so many people do nowadays. I'm on Linux and I use F-Spot for importing, reviewing, organizing/tagging and basic color adjustments. I like it for its versioning system and export functions. The only drawback is the lack of a resize/scale function. For additional image processing I use GIMP. I currently don't post-process much, I love open source and I don't feel that the additional functions I get from CS3 is worth the money compared to GIMP. I use GIMP for almost everything. I tried Lightroom, but I got very annoyed at how it jumped up and down like an overexcited puppy every time I inserted removable media in the USB port. Besides, I prefer to work on a Linux box, so removing Lightroom wasn't that hard of a decision for me. Just Picasa to organize files. I am personally against doing any work on my photos. I use Digikam for organization and initial edits, and The Gimp for the more thorough work. Yeah, I'm a Linux fan! Professionally, PhotoshopCS2, on a PC. Personally, at home, Corel PSPX (11 bombed). Also on a PC. My archives are all in well-organized folders, so I don't bother with tags. Photoshop CS3 with some plugins: PtLens, Noise Ninja, Nik Color Efex. When I was on my laptop PC, I used Photoshop 7, then Photofiltre (not open source but free) that was lightier and almost as powerful. Then on Mac, first I had Photoshop Elements 2 and 4. Then I got a license for Photoshop CS2 but now I mainly use Lightroom. I'm really in love with this one !! on a mac.. i use lightroom and photoshop cs3. Lightroom for organization and most of the initial image edits... then to photoshop for final sharpening. I use Aperture and Photoshop CS3. I have tried Lightroom and seriously considered it but Aperture fite the way I work better than Lightroom. I used to use Canon's DPP, however I am learning Adobe Lightroom. It has more power and flexibility than DPP. However I am not an expert with Photoshop and learning all the little tweaks takes some learning. Adobe Photoshop CS3 Extended for whatever I can't do in Bridge. I use Lightroom and PS . The two together are powerful developing tools ! Ehm... I use FastStone for organizing and The Gimp for retouching. About reasons, well, I'm not enough professional and I love open source. While most of my photos are nothing more than for personal enjoyment, I do need to do a bit of post on them to clean them up a bit. First step is iPhoto to get the shots off the camera & archiving them. I also use it for initial cropping & rotation of each shot. Major drawback is that the tagging feature in iPhoto is rather lacking. But the alternative is $300 Aperture. I'll go cheap for now. Then it's into Photoshop Elements 2.0 and use Neat Image and Power Retouche plug-ins for noise reduction and white-balance respectively... or just manually tweak the levels. PSE2.0 is an old version but still works well enough for what I need to do. Maybe when I replace my point & shoot with a D40, I'll think about replacing software, too. For me it's Lightroom and Photoshop CS3. I love the way these two programs work together. The heavy lifting is handled by PS while the organizational stuff like keyword tagging is better handled in Lightroom.